Why is it that some of the best and most amazing female singers in the English language are women for whom English is not their native tongue? 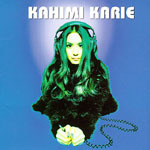 Brazil's Astrud Gilberto is one example, Kahimi Karie is another. Former girlfriend and song-writing partner of Japanese pop star/icon Cornelius as well as platonic song-writing partner of Scottish sensation Momus, Kahimi's voice pours out of these songs as soft and as sweet as a Himalayan kitten dusted in powdered sugar. On this, her first internationally-available release, Kahimi purrs out lounge to dream pop pieces written for her by Momus and Cornelius as well as some pieces of her own and various other luminaries from the Japanese and French pop scene. She's even joined by Beck on one track-playing harmonica on a particularly sultry 'Lolitapop Dollhouse'.